The Lesser Sunda Islands consist of two geologically distinct archipelagos. 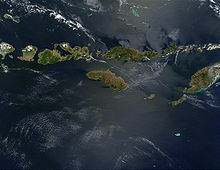 The northern archipelago, which includes Bali, Lombok, Sumbawa, Flores and Wetar, is volcanic in origin. A number of these volcanoes, like Mount Rinjani on Lombok, are still active while others, such as Kelimutu on Flores with its three multi-coloured crater lakes, are extinct. The northern archipelago began to be formed during the Pliocene, about 15 million years ago, as a result of the collision between the Australian and the Asian plates. The islands of the southern archipelago, including Sumba, Timor and Babar, are non-volcanic and appear to belong to the Australian plate. The geology and ecology of the northern archipelago share similar history, characteristics, and processes with the southern Maluku Islands, which continue the same island arc to the east. There is a long history of geological study of these regions since Indonesian colonial times; however, the geological formation and progression is not fully understood, and theories of the geological evolution of the islands changed extensively during the last decades of the 20th century. Lying at the collision of two tectonic plates, the Lesser Sunda Islands comprise some of the most geologically complex and active regions in the world. There are a number of volcanoes located on the Lesser Sunda Islands. The Lesser Sunda Islands differ from the large islands of Java or Sumatra in consisting of many small islands, sometimes divided by deep oceanic trenches. Movement of flora and fauna between islands is limited, leading to the evolution of a high rate of localized species, most famously the Komodo dragon. As described by Alfred Wallace in The Malay Archipelago, the Wallace Line passes between Bali and Lombok, along the deep waters of the Lombok Strait which formed a water barrier even when lower sea levels linked the now-separated islands and landmasses on either side. The islands east of the Lombok Strait are part of Wallacea, and are thus characterised by a blend of wildlife of Asian and Australasian origin in this region. Asian species predominate in the Lesser Sundas: Weber's Line, which marks the boundary between the parts of Wallacea with mainly Asian and Australasian species respectively, runs to the east of the group. These islands have the driest climate in Indonesia. A number of the islands east of the Wallace line, from Lombok and Sumbawa east to Flores and Alor, having original vegetation of dry forest rather than the rain forest that covers much of the Indonesian region, have been designated by the World Wildlife Fund as the Lesser Sundas deciduous forests ecoregion. The higher slopes of the islands contain forests of tall Podocarpus conifers and Engelhardias with an undergrowth of lianas, epiphytes, and orchids such as Corybas, Corymborkis, and Malaxis (adder's mouth), while the coastal plains were originally savanna grasses such as the savanna with Borassus flabellifer palm trees on the coasts of Komodo, Rincah and Flores. Although most of the vegetation on these islands is dry forest there are patches of rainforest on these islands too, especially in lowland areas and riverbanks on Komodo, and there is a particular area of dry thorny forest on the southeast coast of Lombok. Thorn trees used to be more common in coastal areas of the islands but have largely been cleared. These islands are home to unique species including seventeen endemic birds (of the 273 birds found on the islands). The endemic mammals are the endangered Flores shrew (Suncus mertensi), the vulnerable Komodo rat (Komodomys rintjanus), and Lombok flying fox (Pteropus lombocensis), Sunda long-eared bat (Nyctophilus heran) while the carnivorous Komodo dragon, which at three metres long and ninety kilograms in weight is the world's largest lizard, is found on Komodo, Rincah, Gili Motang, and the coast of northwestern Flores. More than half of the original vegetation of the islands has been cleared for planting of rice and other crops, for settlement and by consequent forest fires. Only Sumbawa now contains a large area of intact natural forest, while Komodo, Rincah and Padar are now protected as Komodo National Park. While many ecological problems affect both small islands and large landmasses, small islands suffer their particular problems and are highly exposed to external forces. Development pressures on small islands are increasing, although their effects are not always anticipated. Although Indonesia is richly endowed with natural resources, the resources of the small islands of Nusa Tenggara are limited and specialised; furthermore human resources in particular are limited. ^ "Badak Sunda dan Harimau Sunda". "[...] Mr. M. Yamin yang pada 1950-an ketika menjadi Menteri P.P. dan K. mengganti istilah Kepulauan Sunda Kecil menjadi Kepulauan Nusa Tenggara. Sebab, istilah Kepulauan Sunda Kecil diganti dengan Kepulauan Nusa Tenggara, maka istilah Kepulauan Sunda Besar juga tidak lagi digunakan dalam ilmu bumi dan perpetaan nasional Indonesia – meskipun dalam perpetaan Internasional istilah Greater Sunda Islands dan Lesser Sunda Islands masih tetap digunakan." - Ajip Rosidi: Penulis, budayawan. Pikiran Rakyat, 21 August 2010. Retrieved 7 July 2015. ^ a b c Monk,, K.A. ; Fretes, Y.; Reksodiharjo-Lilley, G. (1996). The Ecology of Nusa Tenggara and Maluku. Hong Kong: Periplus Editions Ltd. p. 9. ISBN 962-593-076-0. ^ "Volcanoes of Indonesia: Lesser Sunda Islands". Global Volcanism Program. Smithsonian National Museum of Natural History. Retrieved 1 January 2013. ^ "Lesser Sundas deciduous forests". Terrestrial Ecoregions. World Wildlife Fund. This page was last edited on 22 January 2019, at 12:42 (UTC).